Patch is a contented calico tomcat on his way to hook up with a seductive Siamese when a starving vampire turns him into breakfast--and a vampire kitty-cat. He can’t go back to living (as it were) with his associate Amy because suddenly she smells delicious, and sinking his fangs into her is just wrong. 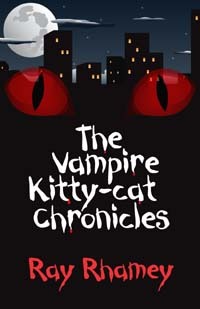 He's plunged into the vampire underground of Bloomsburg, Illinois. But his attacker is a victim too, and she becomes his new associate as they struggle together to find a life. She runs for city council to fight for vampire rights, with Patch as her running mate. In the process, a mob tries to skewer him with a stake, he's tried for murder, just about shotgunned into undead pieces, comes inches from having his tail cut off and seconds from being fried by the sun, and kidnapped twice. Oh, yeah, and turned into a (shudder) politician. On the other paw, he does hook up with that sweet Siamese, and it looks like he's on the way to winning that election . . .